Southern hospitality is something that most people think is just a myth until they go down south and truly experience the difference in culture. In states like Alabama, Louisiana, Florida and Georgia saying “Hey, how you doing” is more than just something you do. It is a life style of truly caring about the well being of another human besides yourself. It is treating the garbage man with the same respect you would give to a CEO of a Fortune 500 company. No one shows these traits more than Roderick Henderson, the humble and gifted young man who is trying to make it to the NFL (National Football League). The 6’1″ 352 pound defensive tackle out of Alabama State, grew up in Montgomery, Alabama playing basketball, tennis and football. Henderson has always been big and nimble. This ability was obvious at a young age. “When I was young, I called myself “Khaq” on the basketball court because I had game like Kobe [Bryant] but a body like Shaq [O’Neal],” joked Henderson. The defensive tackle grew out of playing basketball but played tennis all the way through high school. Henderson credits tennis to helping develop his footwork on the football field. “Tennis helps me keep my feet hot, the side to side movement has definitely helped improve my overall footwork,” said Henderson. Football is the sport that Henderson excelled in and his talent was evident right away. Henderson teammates and coaches call him “Ghost”. He originally got the nickname in little league. “I would get in the backfield so fast, the coaches would say he is like a ghost.” As Henderson got older, he continued to be the fast big man who exposed offensive linemen on the way to tackling running backs and sacking quarterbacks. Henderson went on to dominate at Carver-Montgomery High School. As a senior, he piled up 72 total tackles and eight sacks. This led to him getting a scholarship to Southern Mississippi University. 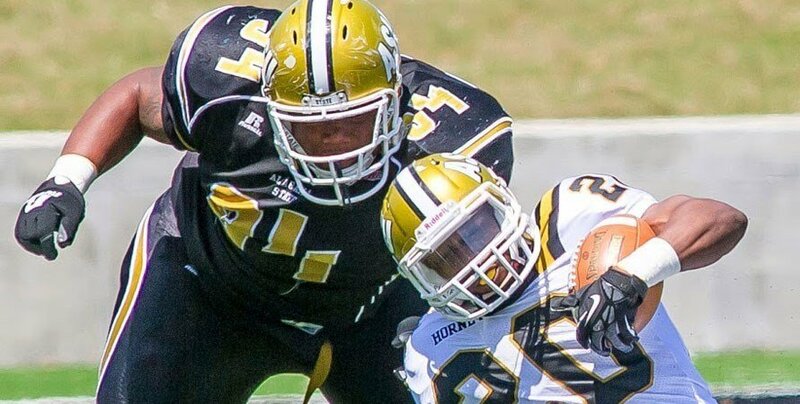 The mild mannered defensive tackle was the total opposite against his SWAC (Southwestern Atlantic Conference) competition. He constantly penetrated through double teams, giving running backs and quarterbacks trouble. “What separates me from other defensive tackles is that I want to get double teamed and create space for the linebackers to make plays,” stated Roderick. This ability to take on double teams and still be productive earned Henderson a spot on the 2016 All-SWAC Defensive team. Henderson believes that his skill-set will translate well to the NFL. He understands that the great defenses like the 2000 Baltimore Ravens were successful because of players like defensive tackle Tony Siragusa. Siragusa would demand the double team to allow linebacker Ray Lewis to run and make plays unimpeded. Another example of a defensive tackle sacrificing for his teammates is one of Henderson’s favorite players, Vince Wilfork. Wilfork’s ability to not only make plays but cog the middle to create lanes for others has helped Henderson in his mindset and technique. “I like to watch tape of Vince Wilfork and Warren Sapp before I play,” said Henderson. Which ever team that Henderson lands on will be getting a dedicated player who takes his role seriously. “The team that gets me is getting a great guy. I’m a guy that will not have any off the field issues, and I will be loved in the community,” said Henderson. The southern gentleman may be polite off the field but he’s ruthless on it.